One of the most controversial films of the 1990’s is Oliver Stone’s psychedelic parable of violence and the media, “Natural Born Killers.” With 14 years of hindsight the film stands up as a powerful, in-your-face statement about the public’s obsession with violence and true crime. Watching the film, it’s hard to believe the script started off as a Quentin Tarantino film. Though the visual style and statement-making satirical tone is wholly Oliver Stone, some of the Tarantino hallmarks remain. 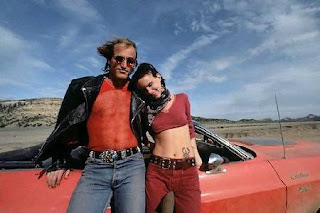 The murderous duo, Mickey and Mallory, on the road and on the run, contain many of the humorous dialogue interaction and genre-reverence as Tarantino’s scripts for “True Romance”, “From Dusk till Dawn”. But in the hands of Stone, and his co-writers it became a beast through he could make his type of grand statements. Since it's a satire the extreme flourishes are necessary and make the statement stronger. None of the freneticness would work if the film wasn't entertaining. Harrelson and Lewis make a wonderful fun loving couple of psychotics. If anything Juliette Lewis’ character treads too much on the performances from her other films (ie. “Kalifornia”), but Harrelson who is cast against type has the screen presence and confidence to pull off his conflicted character. Around every corner is a number of wonderful scene stealer supporting performances. Tom Sizemore’s extreme ‘bad cop’ Jack Scagnetti and Tommy Lee Jones’ prison warden Jack McClusky are even more repulsive than Mickey and Mallory. But it’s Robert Downey Jr.’s Aussie TV talk show host Wayne Gale who shines. It's one of Downey's best characters. Although Gale is manic, absurd and goes over the edge his TV interview with Mickey brings out a sharp intelligence to his character. Key to Stone's statement is his bold cinematic style. Stone exaggerates his innovative multi-format, multi-media techniques he used in 1991's "JFK". It's a monumental achievement to (arguably) create coherence from the almost random cornucopia of imagery and sound mashed together. In the DVD audio commentary Stone ends his discussion by giving extra special thanks to his negative cutter who had the hardest job on the production, assembling the final film from over 3000 edits from multiple format sources. "Natural Born Killers" was one of the last films in a remarkably creative, productive and innovative 10 year run of filmmaking for Stone. Between 1986 and 1995 he made 10 films ("Nixon" is last). The effect of such concentration probably burned him out creatively and we may never see Stone reach the cultural relevance he achieved in this period.